✔ Powered by dual 18650 batteries. ✔ 235W maximum output. 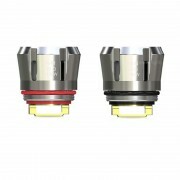 ✔ 6.5ml ELLO Duro Sub-Ohm Tank. ✔ HW-N Net and HW-M Multihole heads. Eleaf Lexicon Kit features unique "Light Show" outline design with multiple LED lights, which includes Lexicon 235W TC Mod and 6.5ml ELLO Duro PMMA Sub-Ohm Tank. 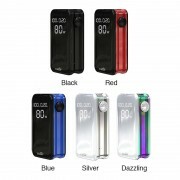 The Mod is powered by dual 18650 batteries and delivers maximum output up to 235W. It supports nickel, titanium, stainless steel 316 and TCR modes in temperature control mode. The Lexicon mod also comes with stealth mode and preheat function. The ELLO Duro tank with PMMA Acrylic tube and drip tip, features triple airflow slots, you can adjust it for your preferences. 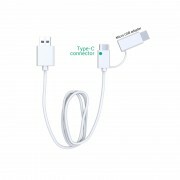 Its retractable top fill design allows you to refill it more convenient. The new HW-N Net and HW-M Multihole heads provides you with intense flavor and balanced vapor. ➤ 1. Powered by dual 18650 batteries and delivers 235W maximum output. ➤ 2. 6.5ml ELLO Duro Sub-Ohm Tank. ➤ 3. Supports nickel, titanium, stainless steel 316 and TCR modes in temperature control mode. ➤ 4. Stealth mode and preheat function. ➤ 5. The ELLO Duro tank features triple airflow slots. ➤ 6. Retractable top fill design. ➤ 7. HW-N Net and HW-M Multihole heads. ➤ 8. With the PMMA Acrylic tube and drip tip. ♻ 6 months for Eleaf Lexicon kit.